An Ode detailing some of the highs and lows of being a Car Mechanic. It's always a joy to take your vehicle in for a service or an MOT and you know you can leave your car, knowing he'll do a full and professional job on it. So if he's a proven good runner and his big end's not gone yet then this ode might just be right for him! Features a cartoon of a Male Car Mechanic, (who is just about to put the car back together, after a nice cuppa that is)! 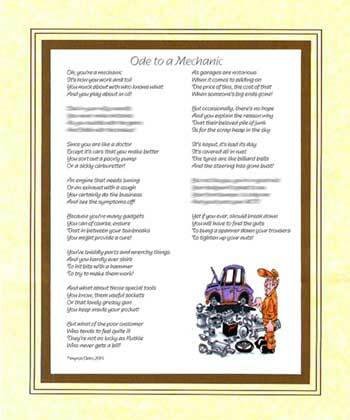 This ode is only suitable for male mechanics. We strongly recommend that you personalise this Ode for FREE by choosing your own title ie/ "Ode to Norman - The Super Car Mechanic" you also have the option to send us a favorite photo to replace our graphic which will create a really special and personal gift.